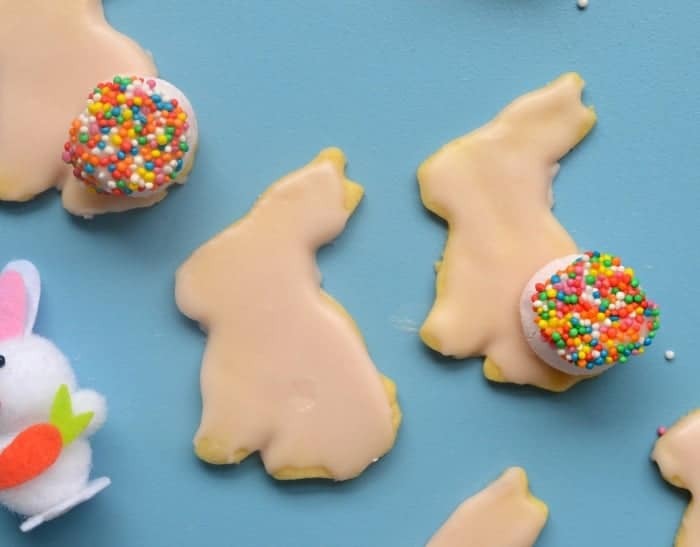 These Easter Bunny Biscuits are a great activity to do with the kids! 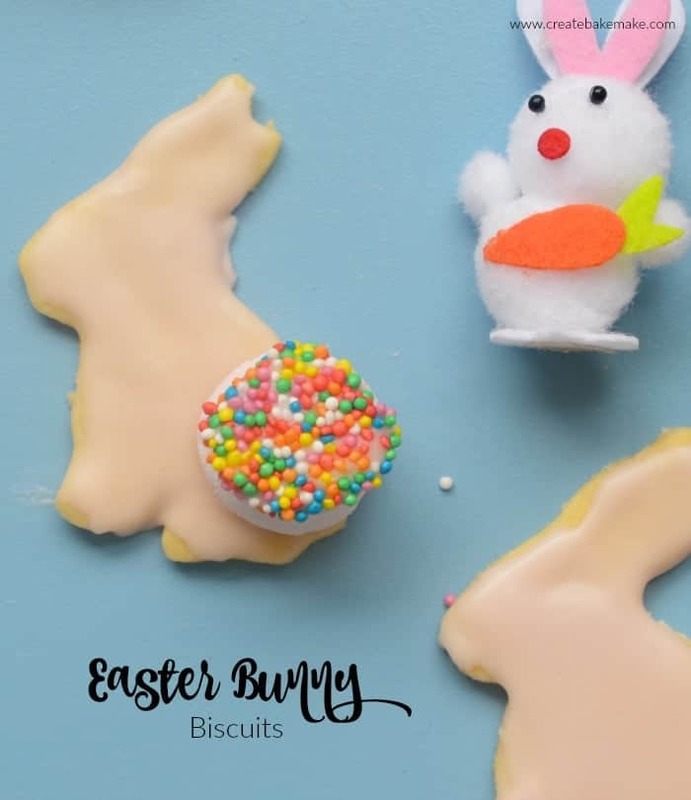 Mr 4 and I were looking for an activity to keep us both entertained earlier this week and we decided to finally make a start on our Easter baking with these easy Easter Bunny Biscuits. The biscuit recipe we used is this Vanilla Snap Biscuit recipe, as it’s simple to put together and holds its shape really well when using a biscuit cutter. 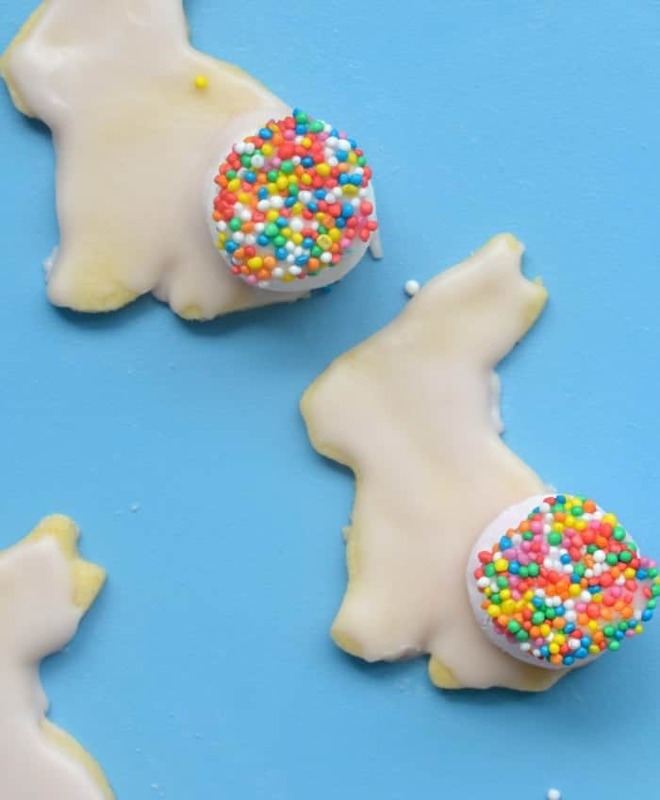 We then continued to keep things easy by making a basic icing to decorate these biscuits with, Mr 4 decided he wanted pink bunnies and I certainly wasn’t going to disagree! You could however keep these Easter Bunny Biscuits plain if your prefer. When it comes to making the icing, you want it so it’s spreadable (we used a spatula to do this) and you don’t want it too runny as it will just slide straight off the biscuits. Again you could just stop with iced Easter Bunny Biscuits, however we decided to give our Easter Bunnies a yummy tail, we simply dipped one end of a marshmallow into the icing and then covered it with 100s and 1000s, and we both agreed this made our Easter Bunny Biscuits look super cute! You could also use a mini marshmallow for a tail or you could decorate your biscuits with icing pens, it really is up to you – and the kids of course! 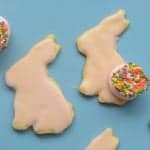 These easy Easter Bunny Biscuits are a great simple easter activity for the kids. This vanilla biscuit dough is freezer friendly and Thermomix instructions are also included. 1 1/2 tablespoons of boiling water. Preheat your oven to 180 degrees celsius and line two trays with baking paper. Place the butter, caster sugar and vanilla extract into the bowl of an electric mixer and mix until light and fluffy. Add the flour, egg and extra egg yolk and beat together to form a smooth dough begins to form. Turn the dough out onto a bench which as been dusted with flower and lightly knead to bring it into a ball and wrap in cling wrap. Pop it into the fridge for 30 mins to chill. Roll out the chilled dough (thickness of 5mm) between two sheets of baking paper and use a bunny cookie cutter to cut out the shapes. Place the biscuits onto your prepared baking tray and repeat until dough has been used (please note you can store any excess dough in the fridge to make later). Bake in oven for 10-12 minutes or until golden around the edges. Allow the biscuits to cool on the tray for 10 minutes before carefully transferring to a wire rack to cool completely. Once the biscuits have cooled, combine the icing ingredients and mix together until a smooth consistency is achieved. If you mixture is too runny, simply add a little extra icing sugar. Ice the cooled biscuits while on the wire rack. You can create a marshmallow 'tail' by dipping one end of the marshmallow into the icing and then sprinkle 100s and 1000s over the top. Place them onto the bunny biscutis and allow them to set. Store the decorated biscuits in an airtight container for up to five days. This biscuit dough can be frozen. Place the butter, caster sugar and vanilla extract into your Thermomix bowl and mix for 30 seconds, speed 3. Scrape down the sides of the bowl and mix for a further 20 seconds, speed 3 until the mixture is pale and creamy. Add the flour, egg and extra egg yolk and and mix for 10 seconds, speed 4. Scrape down the sides of the bowl and select the ‘kneading’ function and knead for 2 minutes. Turn the dough out onto a bench which as been dusted with flour or a Thermomat and lightly knead to bring it into a ball and wrap in cling wrap. Pop it into the fridge for 30 mins to chill. Ice the cooled biscuits while on the wire rack. You can create a marshmallow ‘tail’ by dipping one end of the marshmallow into the icing and then sprinkle 100s and 1000s over the top. Place them onto the bunny biscuits and allow them to set. 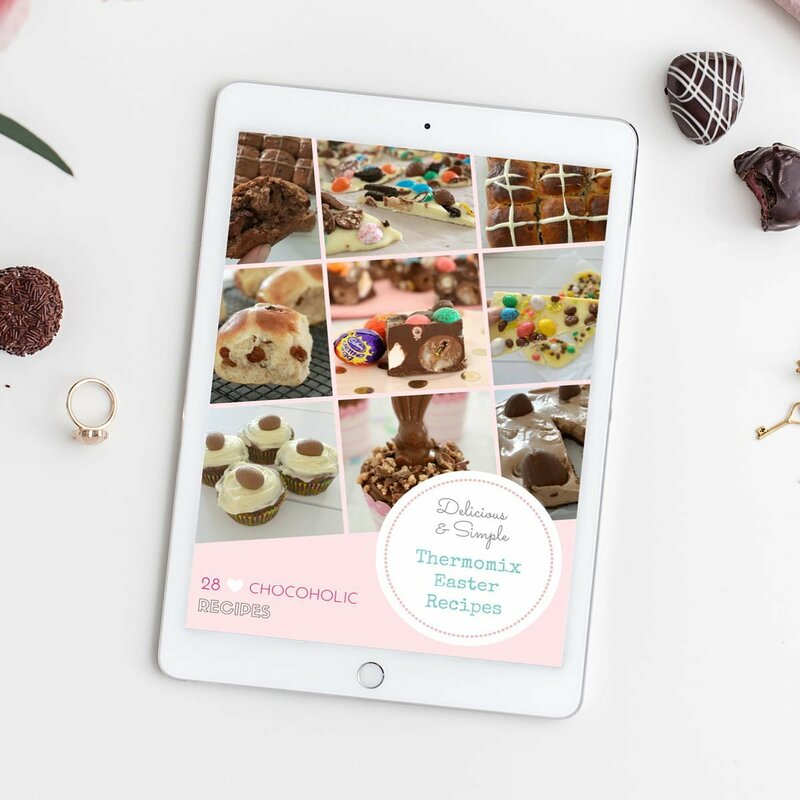 For more great Thermomix Easter recipes, grab your copy of our Thermomix Easter recipe eBook. You can shop the entire range of print and eBooks here.